and the best new independent, world, documentary and experimental cinema, including our picks from festivals such as Sundance, Slamdance, Toronto and Cannes; contemporary world cinema from Africa, Asia, Europe and the Middle East; films by emerging American auteurs; our annual showcase of Milwaukee and Wisconsin work, and a talks and panels with behind-the-scenes insights from filmmakers, writers, agents and digital game designers. Festival programs begin at 7:00 pm Thursday, March 27. On Friday, March 28, the African Studies Spring Symposium takes place from 10:00 am to 4:00 pm, with Festival film programs resuming at 5:00 pm. Programs run all day and evening Saturday and Sunday, March 29 and 30. For complete Festival ticket and package buying instructions, order forms and Box Office hours, visit the Festival website. More information is also found starting on page 9 in this guide. Films from around the world. from around the block. 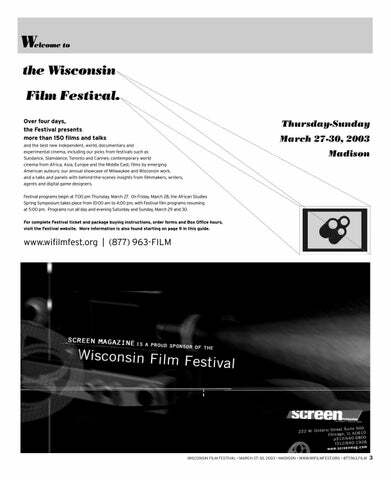 Visit the 2003 Wisconsin Film Festival website for the expanded film program, schedule and travel information, and a handy Wishlist / Itinerary Planner to help you pick films and fill out your ticket order form. High school students are stylishly exposed in Better Luck Tomorrow. Spellbound is the Academy Award-nominated portrait of competition at the National Spelling Bee. Better Luck Tomorrow, a stylish and unnerving “amorality tale” of overachieving high school students, with filmmaker Justin Lin in person and post- film discussion to include Roger Ebert; Detective Fiction, the debut feature from Twin Cities writer/director Patrick Coyle, featured at Sundance 2003; Scumrock, Jon Moritsugu’s riotous take on an earnest filmmaker and a wannabe rocker striving to stay independent; and Greg Pak’s Slamdance-featured Robot Stories—four stories about love, death, family . . . and robots. Stevie, the engrossing and heartbreaking new documentary from Steve James and the makers of Hoop Dreams; the Academy Award-nominated Spellbound, a compelling portrait of kids who compete in the National Spelling Bee; Investigation of a Flame, Lynne Sachs’ poetic look at an act of civil disobedience by the “Catonsville Nine” Vietnam War protestors; and The Weather Underground, in which former members of the US radical group recount their political passions and actions. Samantha Morton is Morvern Callar. The Beatles shine in A Hard Days’ Night. Open Hearts explores the tragic intersection in the lives of two couples. World Cinema Morvern Callar, a dark, quirky road movie from Scotland’s Lynne Ramsay (Ratcatcher) starring Samantha Morton; Susan Bier’s Open Hearts, one of the most powerful Dogme films to date; The Son (Le Fils), Jean-Pierre and Luc Dardenne’s riveting follow-up to their award -winning Rosetta (1999); Ten, celebrated writer-director Abbas Kiarostami’s “dashboard cam” portrait of modern Iranian life; Divine Intervention, Palestinian director and performer Elia Suleiman’s darkly comic masterpiece; Asurot (Detained) a documentary on three Palestinian widows living in a house occupied by the Israeli army; legendary director Im Kwon-taek’s Chi-hwa-seon, depicting a volatile and hedonistic artist in 19th Century Korea (presented by Mike Wilmington); and Devils on the Doorstep, an absurd tragicomedy set in a Chinese village during the 1930s Japanese occupation. Palestinian widows live in an Israeli army-occupied house in Asurot (Detained). Cinema classics presented by renowned film critics, including A Hard Day’s Night (Roger Ebert) and The Manchurian Candidate (Mike Wilmington). New African Cinema Waiting for Happiness, a lyrical portrait of Mauritanian life in transition from Abderrahmane Sissako (Life on Earth); The Season of Men (La Saison des hommes), exploring the domestic lives of modern Tunisian women, with filmmaker Moufida Tlatli (The Silences of the Palace) in person; Bamako Sigi Kan, an unconventional look at the capital of Mali by filmmaker Manthia Diawara (also in person); the sumptuous Satin Rouge, in which a Tunisian widow discovers herself as a cabaret belly-dancer; and films from the New York’s African Film Festival, including L’Afrance (Senegal), Alain Gomis’ exploration of migration and identity; Bronx Barbès (Ivory Coast), an unflinching portrait of gang life by anthropologist Elaine de Latour; and 100 Days, a searing drama of the 1994 Rwandan genocide. The UW-Madison African Studies annual Spring Symposium on Contemporary African Cinema takes place Friday, March 28. Made possible in part by the Wisconsin Humanities Council. Mid 20th-century Wisconsin is the setting for Red Betsy. Waiting for Happiness is a lyrical portrait of Mauritanian life. Films include the features Red Betsy, a 1940s rural drama written and directed by Chris Boebel and co-produced by Andrew Lang, and Making Revolution, Dan Klein’s tongue-in-cheek portrait of student activism. Documentaries include The Way of the Pow Wow by Douglas Spotted Eagle and Indigenous Productions; Breath Control: The History of the Human Beat Box by Joey Garfield; My Family, My Neighborhood by Milwaukee filmmaker Tamara Grigsby; Bum’s Paradise by MATC alumnus Toma McCabe; Man, Made by Milwaukee native Aaron Greer, and Our Brothers, Our Sons by Marquette University graduate Jim Arnold. Inner-city Milwaukee is the focus of My Family, My Neighborhood. The Eye, an eerie and stylish horror-thriller from the Pang Brothers (Bangkok Dangerous); Spun, a dizzying trip through addiction by music video director Jonas Akerlund; and Paul and Curtis Hannum’s The Real Old Testament—find out what happens when Biblical patriarchs start getting real! The Season of Men explores lives of modern Tunisian women. Spotlight on Filmmakers With influential filmmaker, visual artist and musician Michael Snow in person, the Festival presents work from his seminal 1967 Wavelength to his latest media exploration, Digital Snow, to his new feature film, *Corpus Callosum. Snow’s visit keynotes a special focus on experimental film, which also features Pat O’Neill’s The Decay of Fiction; Rodney Graham’s Two Generators ; and Nicolas Rey’s Les Soviets plus l’électricité. The Festival also welcomes respected independent filmmaker Su Friedrich, with her new documentary The Odds of Recovery as well as Hide and Seek and Rules of the Road. Milwaukee filmmakers showing experimental work include Meredith Root, Andrea Leuteneker, Christine Khalafian, Jennifer Montgomery and Jack Cronin. Eve and Adam in The Real Old Testament. Panels and Discussions The annual Saturday morning Writers Seminar features writer/directors Justin Lin (Better Luck Tomorrow), Patrick Coyle (Detective Fiction) and Curtis Hannum (The Real Old Testament). Kara Baker-Young (The Gersh Agency, New York) shares insights on being a motion picture agent from and Cyrus Nowrasteh (The Day Reagan Was Shot) offers tips on being a working writer in Hollywood in our informal coffeehouse discussions. Author Laurie Scheer discusses “Creative Careers in Hollywood” and Eric Zimmerman, co founder of the NYC- based gameLab, talks about designing experimental and independent digital games. *Corpus Callosum is the new feature film from featured artist Michael Snow. An Introduction to Michael Snow’s Films Renowned expert of Canadian experimental cinema, scholar and journalist Bart Testa will discuss the career of this year’s distinguished Festival Spotlight artist, Michael Snow. Cinematheque | Order Code: WS1 A collection of films by Wisconsin filmmakers, including Meredith Root, Jack Cronin and Scott Stark. With filmmakers Meredith Root (Girl 24), Jack Cronin (My Neighbor) and Brian Dehler (Radio Rails) in person. Jon Moritsugu’s latest feature is a riotous take on the “rage against the machine” message, as an earnest filmmaker and a wannabe rocker strive to stay independent. imentation catches up with three friends when they are unexpectedly reunited a decade later. Director Mahamet- Saleh Haroun offers a “documentary fiction” that explores the role of both film and filmmaker within Chadian society. results, as an Indian family living in London tries to raise their soccer-obsessed daughter in a traditional way. takes an unlikely journey of self-discovery in this sumptuous and unexpected romantic drama. Wisconsin Film Festival Programmer James Kreul will discuss Rodney Graham’s work and its connection to experimental film practice, drawing upon examples to be featured at this year’s Wisconsin Film Festival. A collection of shorts by Wisconsin filmmakers, including Austin Alward, KJ Mohr, Pete McPartland and Robert Trondson. With filmmakers Austin Alward (Karma Wheel), Catherine Crouch and KJ Mohr (Pretty Ladies), Robert Trondson, Erik Gunneson, Kristy Dickens and Amy McIntyre (Range Life) and Pete McPartland Jr. (Sunny & Diane) in person. Strom travels the Trans Siberian Railroad to explore the history of the Jewish Autonomous Region of Siberia, artificially invented by Stalin in 1928.
escape from his crumbling marriage in the form of film-noir fantasy as he begins writing a detective novel that mirrors his life. With filmmaker Patrick Coyle in person. An eclectic collection of experimental and documentary shorts from Wisconsin collegiate students. cal, Michael Snow’s most recent film explores the boundaries between traditional experimental techniques and digital computer technology. With filmmaker Michael Snow and scholar Bart Testa in person. Wisconsin, Red Betsy portrays a close-knit family dealing with loss and change during a pivotal time in American history. A Wisconsin’s Own Competition Entry. With filmmakers Chris Boebel, Andrew Lang and Lemore Syvan and actors Allison Elliot, Lois Smith and Brent Crawford in person. The Sea Family secrets and years of pent-up emotion are unleashed when a powerful patriarch calls his children home to make an important announcement. The Motion Picture Agent: What do they do, how do you get one, and what do you do when you’ve got one? Get the inside scoop from UW-Madison alumnus and agent Kara Baker-Young (The Gersh Agency, New York). acclaimed Belgian director, a film inspired by the fifth volume of Proust’s Remembrance of Things Past. spans 50 years of South African history, illuminating the integral role that black freedom music played in the struggle to end apartheid. ping cinematography, legendary director Im Kwontaek depicts the rise of a volatile and hedonistic artist in 19th Century Korea. With introduction and postfilm discussion by film critic Mike Wilmington. Refrigerator Mothers This documentary explores the traumatic legacy of blame, guilt and self-doubt suffered by a generation of women blamed for causing their childrens’ autism. With producers J.J. Hanley and Gordon Quinn (Kartemquin Films) in person. Xperimental Women Different visions of the world, the public, the private, the body and our daily lives, are explored in this experimental film series by women from Wisconsin, Chicago and France. With filmmakers Christine Khalafian (Mark Set Burn) and Jennifer Montgomery (I, a Lamb) in person. young love, inspired by traditional Thai musical theater. ic of the projectionist from the early days of cinema, Luis Recoder re-shapes found footage not only through editing but also by threading multiple strips of film in the same projector. “We are not in an epoch of a ‘rediscovery’ of film but the first witnesses of its coming into being in the nearness of its death.”—Luis Recoder. With film artist Luis Recoder in person. In the Madison Art Center 3rd Floor Auditorium. A Hard Day’s Night The Beatles shine in Richard Lester’s energetic rock & roll classic. “One of the great landmarks of the movies!” — Roger Ebert. With introduction and postfilm discussion by film critic Roger Ebert. Asurot (MIDWEST PREMIERE) Three Palestinian widows in Hebron, their struggles and survival in a house occupied by the Israeli army. West African life in transition from Abderrahmane Sissako, director of the acclaimed millennium film Life on Earth. former Elia Suleiman delivers a darkly comic masterpiece and a devastating commentary on Palestinians and Israelis living in uncertain times. African Shorts Program I Short films from the Ivory Coast, Tanzania/Zimbabwe, and Ethiopia. escapes a dreary life as a grocery clerk with the help of an unexpected gift from her boyfriend. Akerlund’s first feature film is a dizzying trip through the world of crystal meth addiction, and the twisted community that exists within it. Student Shows feature the work of many UW-Milwaukee filmmakers including Simone Baker, Alexander Boguslavsky, Scott K. Foley, Shu-ling Hsieh, William Leighton, Blyth Renate Meier, Andrew Steven Rosas and Moonaya Yahya. gang life in an African shanty town, directed by noted anthropologist Elaine de Latour. Giant Spider Invasion At last! “The picture that comes complete with a 10foot tall monster to give you the wim-wams!” Introduction by author and film critic Kevin Murphy, an alumnus of both UW-Madison and Mystery Science Theatre 3000.
pher. This documentary reveals a quotidien Jacques Derrida, the father of Deconstruction, as it seeks to interpret the relationship between the writer and the writings. nee for Best Documentary Feature, the remarkably compelling Spellbound tracks eight motivated youths who train for and compete in the National Spelling Bee. based archival footage to an original symphonic score by Michael Gordon. “A portrait of humanity using decay, our battle with time, as its common language.” —Bill Morrison. Followed immediately by the free screening of Two Generators. Storytelling: Student Narrative and Animated Shorts By turns whimsical, provocative, and hilarious, this program presents the best of Wisconsin student narrative and animated film. simple and austere story about a carpentry instructor who takes on a new apprentice and must come to terms with their intertwined pasts. set in a Chinese village during the 1930s Japanese occupation. African Shorts Program II Short films from Zimbabwe and the Congo. With filmmaker Mweze Ngangura (The King, the Cow and the Banana Tree) in person. Projecting the Past: Europe Experimental directors from both sides of the Atlantic visit the past of Europe, using a combination of personal impressions and memories, archival and original images, family footage, and actual travelling. dent living in Paris, this film explores issues relating to migration and identity. returns to the rural town where ten years earlier he was a “big brother” to a troubled young boy. From the makers of Hoop Dreams. With producer Gordon Quinn in person. Followed by “making of” discussion on the production and video-to-film transfer with representatives from Eastman Kodak and icubed (Chicago). An annual WFF event remembering Mark Bergman and Madison’s film society days. Includes a special screening of a film Billy WIlder’s Kiss Me, Stupid, and discussion with panelists including Mike Wilmington. A lively and informal session with author Laurie Scheer, based upon her book of the same name, looking at work life in Hollywood through the lens of Hollywood. and her family struggling to survive the 1994 Rwandan genocide. How to be a Working Writer (and not a Waiter) in Hollywood Wisconsin native Cyrus Nowrasteh (writer/director of Showtime’s The Day Reagan Was Shot) will share insights from his multi-faceted career. Game Design and Game Culture — Where are the Indie Games? Eric Zimmerman, co-founder of the NYC- based gameLab, talks about his work designing experimental and independent digital games. gameLab’s interactive Fluid kiosk will be on display in the Madison Art Center during open hours from March 25 - 30. Hitchens book, this powerful documentary examines war crimes charges leveled again the former secretary of state. Introduction and discussion with Bill Lueders, Isthmus new editor. Rodney Graham exhibit at the Madison Art Center, Two Generators is the first of Graham’s single concept, single-shot films. A free screening in which the single reel of film will be projected, rewound, and projected repeatedly. Sigler, who has been living with breast cancer since 1985. A Wisconsin’s Own Competition Entry. With filmmakers David Fleer, Brad Milsap and Steve Andersen in person. 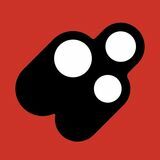 al Kino filmmaking community, preceded by Kino shorts from right here in Madison! Milwaukee Independent Film Society (MIFS) Meet and Greet Wisconsin and Milwaukee media-makers will be on hand to talk about their projects, along with MIFS Board Members who can discuss the Film Society and its mission to promote and support independent media making. Come see what’s going on with MIFS, it’s members, and local producers. From The Other Side Chantal Akerman continues her triptych after D’est (From the East) in 1993 and South in 1999. In this film, she focuses on the Mexico / United States: a long and almost impenetrable border. takes place in a woman’s world, referring to the one month each year that the men of the island of Djerba return home from work in Tunis. With filmmaker Moufida Tlatli in person. of Recovery as “a film about six surgeries, one bad hormone problem, a 15-year relationship and the onset of middle age.” Friedrich documents her journey toward wellness and interaction with the medical establishment. With filmmaker Su Friedrich in person. lows itinerant teachers who wander the unforgiving mountains of Iranian Kurdistan. I Exist: Voices from the Lesbian & Gay Middle Eastern Community in the U.S. (MIDWEST PREMIERE) This documentary gives a voice to lesbians and gays of Middle Eastern descent living in the USA. Detective Fiction (MIDWEST PREMIERE) Forced into sobriety, Jack seeks escape from his crumbling marriage in the form of film-noir fantasy as he begins writing a detective novel that mirrors his life. With filmmaker Patrick Coyle in person. Please note: Individual titles of short films shown as part of an overall program are not listed here. Only the overall program title is listed. Please see the website for full film listing. Justin Lin presents an electrifying glimpse into the lives of suburban, Asian American high-school students. With filmmaker Justin Lin in person. Post- film discussion to include film critic Roger Ebert. ment in the development of Hip Hop music— finally gets the credit it deserves in this engaging documentary. A Wisconsin’s Own Competition Entry. With filmmaker Joey Garfield in person. for the love of a woman in a small Senegalese fishing village. Festival programs are subject to change. Many Festival films are not rated. Viewer and parental discretion is advised. The Weather Underground (MIDWEST PREMIERE) Former members of the US radical group The Weather Underground speak about the passions that drove them to “bring the war home” and the actions that placed them on the FBI’s most- wanted list. With filmmaker and UW-Madison alumnus Bill Siegel in person. punk scene in China. For these kids, music is much more than music, it’s a means of free expression, pure emotion, and hope for the future. TBA Film to be announced. The Manchurian Candidate In John Frankenheimer’s masterful neo-noir fable of Cold War paranoia, a Commie brainwasher conspires to turn a group of American soldiers into sleeper agents. With introduction by film critic Mike Wilmington. presidential elections hinged on one state. This provocative documentary reveals just how undemocratic Florida’s electoral process really was. remote corners of the globe to see what life is like Elsewhere. It gives us a sense of what unites us all, what divides us and what reactions our actions bring. There will be a brief intermission during this film. Hebron, their struggles and survival in a house occupied by the Israeli army. Wisconsin’s Own Winners Screening 1 Screening of winning films from the Wisconsin’s Own Competition (announced evening of Sat., Mar. 29). trait of West African life in transition from Abderrahmane Sissako, director of the acclaimed millennium film Life on Earth. follows itinerant teachers who wander the unforgiving mountains of Iranian Kurdistan. Presents Hilarious sight gags and a monumental montage of images challenge the expectations we normally bring to the film-viewing process. With introduction by filmmaker Michael Snow and Bart Testa. Spun (WISCONSIN PREMIERE) Music video director Jonas Akerlund’s first feature film is a dizzying trip through the world of crystal meth addiction, and the twisted community that exists within it. ple and austere story about a carpentry instructor who takes on a new apprentice and must come to terms with their intertwined pasts. Wisconsin’s Own / Student Winners Screening 2 Screening of winning films from the Wisconsin’s Own and Student Filmmaker Competitions (announced Sat., Mar. 29). an unlikely journey of self-discovery in this sumptuous and unexpected romantic drama. her family struggling to survive the 1994 Rwandan genocide. Robot Stories (WISCONSIN PREMIERE) Four stories about love, death, family . . . and robots. With filmmaker Greg Pak in person. Amandla! A Revolution in Four Part Harmony (MADISON PREMIERE) This celebratory documentary spans 50 years of South African history, illuminating the integral role that black freedom music played in the struggle to end apartheid. La Captive (MADISON PREMIERE) From Chantal Akerman, the acclaimed Belgian director, a film inspired by the fifth volume of Proust’s Remembrance of Things Past. car, through which a complex portrait of the life of a woman in contemporary Iran is slowly revealed. Tickets are required for admission to each program at all festival venues unless otherwise indicated in the program. Advance Ticket Box Office Wisconsin Union Theater Box Office / Annex Room Memorial Union, 800 Langdon Street, Madison Phone (608) 265 -2933 or (608) 262- 5981. Fax: (608) 262- 5869 Check “Today in the Union” (TITU) for special Festival Box Office location. On Feb. 28 and Mar. 1, 2, 7, & 8 Festival tickets cannot be printed for walk-up customers after 5pm (due to theater performance ticketing at those times). Walk-up orders will still be accepted. Tickets will be printed the next day, held at the box office, and must be picked up by March 26. To receive student discount you must present current student ID at time of purchase or enclose photocopy with order. How To Place Your Order 1. Pick your films and talks, using this program/form or the Wishlist, Itinerary Planner and PDF order form on our website. 2. Fill out the order form completely, including 2nd choices. Incomplete forms will not be processed. 3. Submit your order with payment. Bring, mail or fax the completed order form to the Wisconsin Union Theater Box Office, or purchase tickets and packages by phone. There’s a $5 service charge for processing all orders submitted by fax, phone or mail. 4. Advance tickets can be purchased with cash, check or credit card (Visa or MasterCard). Cash only is accepted for ticket purchases at the door, March 27-30. 5. We recommend that you place your order by March 20. After that, the Box Office is very busy and programs may sell out. 6. Orders placed by fax, phone or mail by March 20 will be mailed to you. Orders received March 21-26 will be held for Will Call pickup. 7. Will Call: Wisconsin Union Theater Box Office / Annex Room, 800 Langdon. Hours for March 27-30: Thursday & Friday, 11:30 am – 9:00 pm. Saturday 10:00 am – 6:00 pm; Sunday noon – 6:00 pm. Talks Some talks are free and some require a paid ticket. For free talks seating is limited and on a first come basis. Please list only paid ticketed talks that you would like to attend on your order. Student Price The discounted student price is available to any student (grade school, high school, college, graduate school) with current ID. Bring your (own) ID to the box office or enclose a photocopy of it with your ticket order to receive the student discount. Student status is subject to verification. Festival party tickets are not included in package orders. They can be purchased separately with package or single ticket orders. Single ticket buyers can buy up to four tickets for any individual film screening or other ticketed program. Ticket Packages Buy a group of tickets for yourself or to share with friends and family at a significant discount. Because advance package sales start before single ticket sales, you get priority in film selection. Package buyers must select film tickets (up to four per screening or event) at time of purchase. If you’re having trouble selecting all the films for your ticket package, vouchers can be issued in lieu of tickets. Vouchers can be exchanged later for hard tickets only if still available and only in person at the Wisconsin Union Theater Box Office through March 26 or at the door March 27 through 30. Voucher holders are not guaranteed availability of tickets for exchange nor a seat in any screening. Vouchers are only available with purchase of ticket packages. Special Bonus for package buyers: Coupon for one free video rental at Bongo Video (Madison) with each package purchased at the Box Office. * If still available, single tickets to screenings will be sold at the door at festival venues March 27-30. THE FINE PRINT: Yes, even you need to read this! To guarantee admittance, ticket holders must arrive 15 minutes prior to show. Available seats will be filled at curtain time. Latecomers with tickets are not guaranteed admittance. All sales are final. No refunds for tickets or packages. No replacements for lost tickets. Individual film tickets can be exchanged in person only through March 26 at the Wisconsin Union Theater Box Office, 800 Langdon Street, Madison. Absolutely no exchanges for hard tickets after March 26. Package holder vouchers can be exchanged for tickets if available at the box office through March 26 or at the door March 27 through 30. Original ticket package and receipt must be presented for exchange of tickets or vouchers. NOTE: the Capitol Square is one-way, so don't worry if you miss your turn – you’ll get another chance. If you are headed to Campus, turn right onto Wisconsin Ave. Follow Wisconsin 3 blocks and turn Left onto Gorham St. Follow Gorham until it becomes University Ave., and then you’re on Campus. From Milwaukee, the Badger Bus runs from Mitchell Field and downtown locations to Memorial Union in Madison. (414) 276 -7490 or 608-255-6771 or www.badgerbus.com. CAR Hertz offers a special car rental rate for those attending the Wisconsin Film Festival. Call (800) 654-2240 for information and mention CV# 02R30003. AIR Participating airline Midwest Express Airlines offers a special rate for those attending the Wisconsin Film Festival, available for flights to both Milwaukee and Madison. Contact Midwest Express at (800) 452-2022 (www.midwestexpress.com/conventions), or your travel agent, and refer to File Number CMZ1251. — www.wifilmfest.org — or purchase at the Festival in the Orpheum Theatre lobby. LODGING Want to make a weekend of it? Explore Madison between films? The following establishments graciously offer special rates and amenities for 2003 Festival participants. Please contact them information, and be sure to mention that you are attending the Wisconsin Film Festival. Best Western InnTowner and The Highland Club 2424 University Avenue, Madison, WI 53726 (800) 258-8321; f: (608) 233 -1325 info@inntowner.com; www.inntowner.com Free shuttle from our neighborhood location to venues. Café, cocktail lounge, indoor pool, whirlpool, exercise room, free parking, T1 on concierge level. The Madison Concourse Hotel and Governor’s Club 1 West Dayton St., Madison, WI 53703 (608) 257-6000 / (800) 356-8293; f: (608) 257- 5280 www.concoursehotel.com Madison’s premier hotel, located in the heart of Madison just steps from State Street, the Orpheum and Bartell, and the University of Wisconsin Campus. Stay in affordable luxury in Madison’s “newest” boutique-style hotel. Centrally located to both the campus and downtown film venues. Best Western Inn on the Park 22 S. Carroll St., Madison, WI 53703 (608) 257-8811 / (800) 279-8811; f: (608) 257- 5995 reservations@innonthepark.net; www.innonthepark.net On the Capitol Square, walking distance to Orpheum and Bartell Theatres, shuttle service, complimentary parking, two restaurants, lounges on site. Reservations include: complimentary parking and valet service, nightly wine and cheese course, and complimentary breakfast-in-bed. Two blocks from the Orpheum just off State Street.